Happy new year, everyone! Welcome to 2015! Tell me, did you do something fun and fantastic to ring in the new year? No, seriously, tell me. I spent mine curled in a ball on the couch fighting off the cold that would not end. I hope whatever you did was more fun than that! Even though the new year has been rung, I still have a few favorites from 2014 left to share. This next cake is another created for a photoshoot. I came in on the tail end of this production, which actually works out really, really well for me. Rodeo & Co. along with Emily Herzig Floral Studio had put together a stunningly gorgeous winter wedding shoot at an ice castle here in NH. WellWed Magazine loved the shoot and decided to print it. Only one problem – no cake! This left me with the unusual benefit of having actual dress, floral, and table photos to work from. An absolutely ideal cake situation to be in. This was also my second ice castle shoot to speak of. The temporary ice installation provides for such an unusual and artistic backdrop, it’s no surprise vendors line up in the winter to shoot here. I particularly loved the direction Meg and Emily took with their styling. It was a soft, modern, romantic take on a winter wedding. Meg somehow made the ice glow in the most stunning shade of teal, which provided the perfect backdrop to Emily’s lush, pink florals. Since teal isn’t exactly the most appetizing color for a cake (imho), I decided to stick with pink. The cake is finished with textured pink royal icing tipped with bits of edible gold. 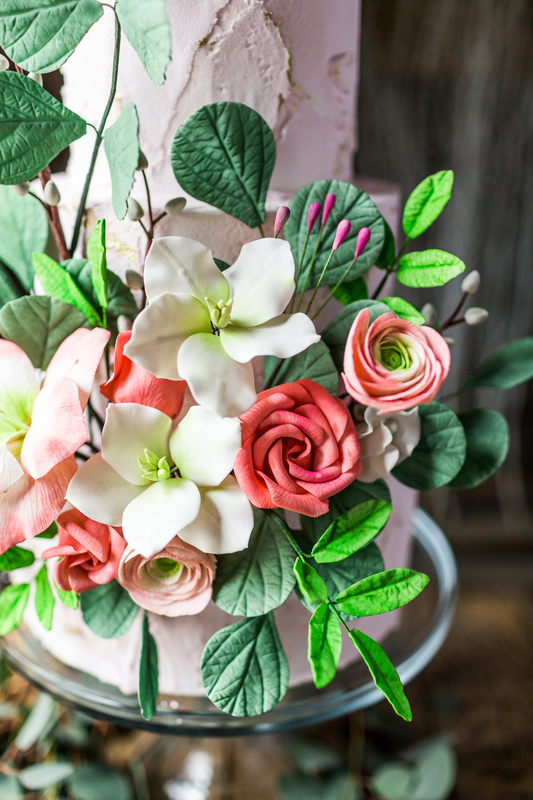 This sugar flower arrangement is undoubtably one of my all-time favorites. 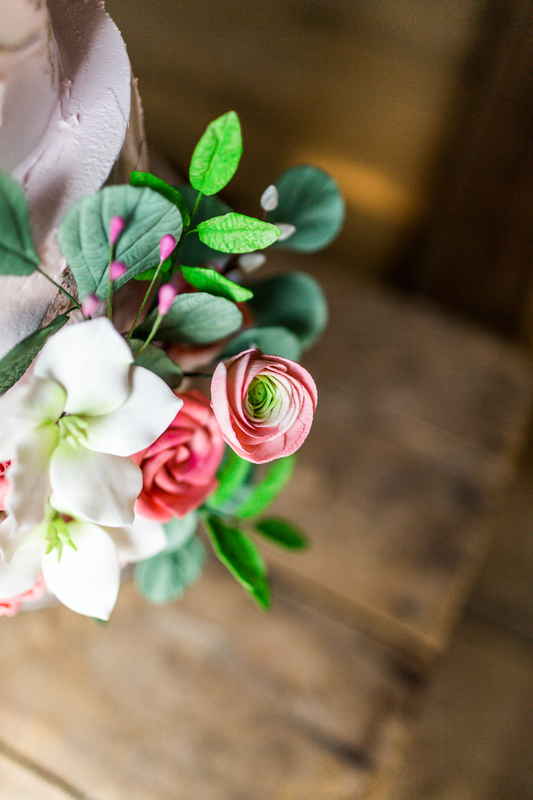 It was directly inspired by the bride’s bouquet, with roses, ranunculus, and lots of greens. You can sneak a peek at the rest of the shoot here or in the most recent issue of WellWed NH/Maine. Beautiful cake, makes me wish I had a wedding to arrange. Our New Year was very quiet and the quiet was welcome since we had a very hectic holiday weekend with guests all over the place. Relaxing with a nice champagne was nice. I suspect you are correct about the cake color. Your colors are beautiful – warm and rich. I always prefer pastels from local bakeries because oftentimes if not pastel the colors are too bright and somewhat garish. Have another great year, Erin. Are you cutting back? I wondered because I saw you were selling many things. 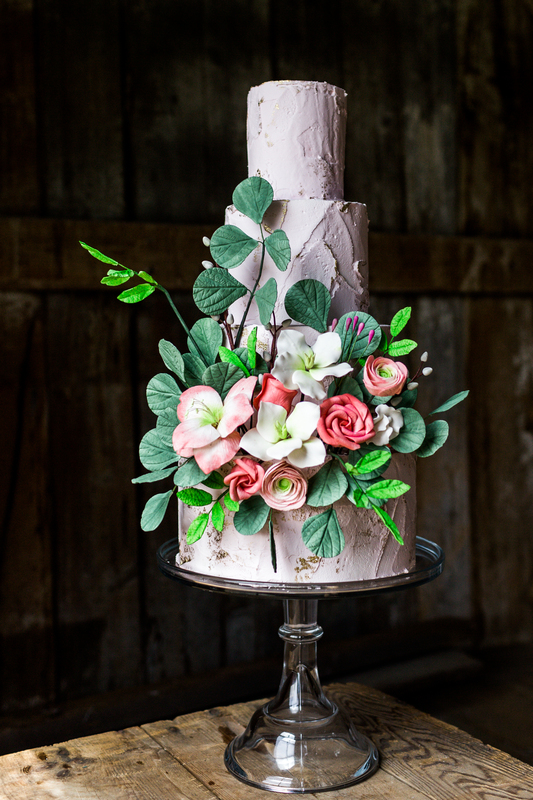 Will you only do wedding cakes at this point or if the opportunity for me to get a summer birthday cake again is that something you would do?